A stay at Sansi Diputacio Hotel places you in the heart of Barcelona, within a 10-minute walk of Casa Batllo and Placa de Catalunya. Featured amenities include a business center, a 24-hour front desk, and luggage storage. Self parking (subject to charges) is available onsite. With a stay at this villa in Estepona, you'll be convenient to Real Club de Golf Guadalmina and Basilica Vega Del Mar. Free self parking is available onsite. 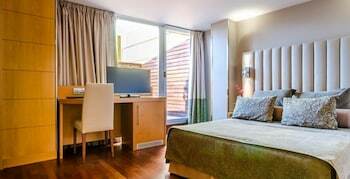 A stay at Hostal Florida places you in the heart of Madrid, within a 10-minute walk of Plaza Mayor and El Rastro. Located in Taberno, Sol de Taberno is in the mountains, a 4-minute drive from Capeas Bullring and 8 minutes from Calvary Chapel. Free self parking is available onsite. With a stay at Hotel Riu Palace Jandia in Pajara, you'll be near the beach, just a 3-minute walk from Matorral Beach and 8 minutes by foot from Morro Jable Shopping Centre.